However, you don’t have to make it spicy, and if you are in search of a really good pizza crust, then you are at the right place. My family often enjoys Farida’s Tandir (Tandoori) Bread, and then we thought about using that bread dough as pizza dough (just take out few steps at the end, the egg wash, and seeds), and how successful are we? Well, everyone says I now make the best pizza in the world! I guess that summarizes it pretty well. Seriously, I don’t even give ordering pizza a thought any more. It is easy to make your own, it’s fun, and it doesn’t take long. Kids love making their own pizza!!! From Farida’s recipe for Tandori Bread, I get 2 medium pizzas, 10” round pan. Also, you can easily make 3-4 personal sized pizzas, depending how big you make them. I have used: Grated mozzarella, fresh mozzarella, extra spicy long peppers, crushed red hot pepper, cajun seasoning for crust, ham, bacon bits, onions, mushrooms, and when done I sprinkle with parmesan. Mix yeast and water in a small bowl, until dissolved completely. Then gradually add it to flour mixed with salt. Make a dough, and then transfer on a floured work surface, and knead for about 5 minutes at least, until it’s nice and elastic. Collect the dough into a ball, and place in a glass bowl, cover tightly with plastic wrap, and leave let it rise until in a warm place until doubled, I usually leave it in a microwave (not turned on of course). Then you punch the air out of the dough, and shape it into a ball, and stretch to the size of the baking pan. Grease the pan with olive oil, and sprinkle all over with corn meal. Shake it to get it all nice and evenly coated. Set the oven to 400° F, it will be ready just in time you are done with making the pizza. Place the dough in the pan, and then press with your fingers towards the edges so you get a pizza that is a bit more thin with a little bit raised edges. If you like to season your edges with anything, like I do with cajun, first brush the edges with some olive oil, and then sprinkle with whatever you like. 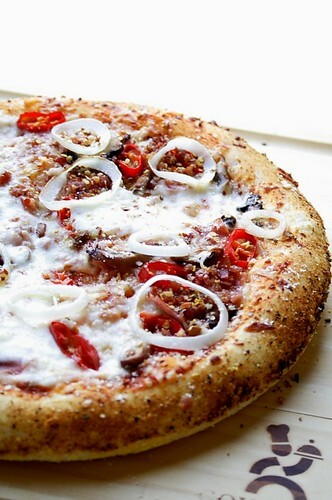 The rest is like any other pizza: pizza sauce, cheese, seasonings, toppings. Bake for about 15-20 minutes, or until done; also you can turn the broiler on for a minute or two for toppings to brown. Enjoy! I am sending this to Branka, this month’s host to Ajme koliko nas je , a food blog event created by Monsoon for food bloggers from ex YU territories. She chose this months main ingredient to be spicy peppers, and I might just go crazy on that one! :) Evo i recept na nasem! OMG! If I could just have a piece! ja sam baš danas radila pizzu :) moja je doduše bila povrtna i blaga, ali vrlo rado bih probala i ovu tvoju paprenu varijantu :) odlično izgleda! Your dough is picture perfect. I'm from Louisiana..so I like it spicy too! Mmm, I love spicy!! This dough looks just gorgeous. I can't wait to try it for myself. 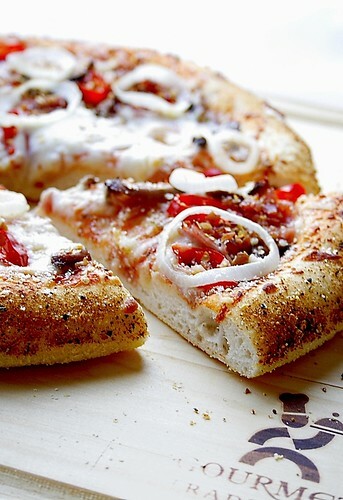 You can never go wrong with fresh, homemade pizza. That crust OMG! perfect!I like it spicy too. And yes, I also like my pizzas spicy, so I will also try your topping. Your pizza looks great! YUM! İ am so happy you like my bread recipe. İ have never attempted to make pizza with it, but now that you encouraged me, I am absolutely making it:) I would probably make mine thinner, as I love thin crust pizza more. Medena it's beautiful...I love spicy too! I'll take a slice of the spicy one please, it looks delicious! Wow, that does sound spicy! Perhaps I'll make half like that for my husband and the other half mild :). It looks like a lovely crust! That looks delicious! I just love vegetables and spices on pizza. Great blog. WOw! I love making pizza from scratch...I thought I was creative, but this is amazing. My husband would drool all over this....Thank you for sharing. I am most definitely going to have to try to make this pizza. My future hubby loves spicy food and it just looks amazing!